In order to help NRA Members navigate their way through the nation’s airports with the least amount of trouble, we asked TSA’s Michael J. Restovich key questions about traveling with firearms and ammunition. In the aftermath of the 9/11 attacks on America, the Transportation Security Administration (TSA) was formed to ensure that every possible step is taken to prevent the use of a commercial airliner as a terrorist weapon. As part of its responsibility to keep the nation’s air traffic system safe and efficient, TSA has the immense duty of screening every single passenger. In that capacity, shooters and hunters traveling with firearms must interact with TSA airport personnel. Every day, thousands of screenings involving air travelers transporting firearms occur without incident, but because there has been concern and, in some cases, dissatisfaction, TSA has sought the assistance of America’s law-abiding gun owners. Working together, NRA and its members can offer suggestions on how TSA might streamline its procedures, and at the same time we can provide a huge boost in public awareness of this vital security operation. By understanding the rules and procedures that must be followed when traveling with firearms and ammunition, we can avoid delays and other potential problems. To provide NRA members with the best answers concerning recurring firearms-related air-travel questions, we sat down with Michael J. Restovich, Assistant Administrator, TSA Office of Security Operations. NRA: Many gun owners become frustrated when traveling with firearms. It seems that every time you go to check in a firearm at an airline baggage counter, the rules have changed. What can travelers do to get through this process as smoothly as possible? TSA: The Federal regulations for transporting firearms and ammunition are actually the same as they were before 9/11/2001. However, the screening process for passengers and checked baggage has changed substantially. The perception that rules have changed is likely due to varying airline requirements as well as differing airport screening-equipment configurations. 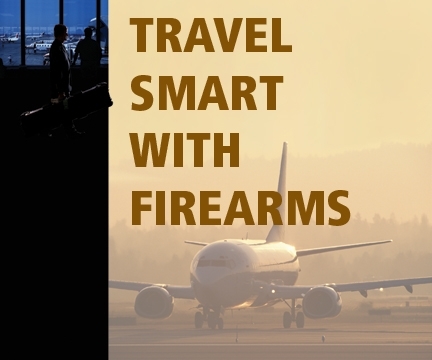 The passenger traveling with firearms can greatly reduce potential problems by knowing the rules and being prepared upon arrival at the airport. Passengers need to know not only what the TSA requirements are, but the airlines’ requirements and also local/state laws at their destination. TSA: Yes. Firearms and ammunition may be packed together in the same locked, hard-sided case, provided a few simple rules are followed (see below for ammunition-packing instructions). The number of firearms and amount of ammunition allowed on individual airlines varies widely. It is highly advisable to check with the airlines ahead of time and have a copy of their policy with you. The hard copy of the policy you produce at the ticket counter will usually settle most issues. If not, ask for a supervisor. NRA: How does ammunition have to be packaged? TSA guidelines say ammunition has to be in “fiber (such as cardboard), wood or metal boxes or other packaging specifically designed to carry small amounts of ammunition,” but a lot of airlines seem to insist on “factory boxes.” Naturally, this creates problems for handloaders or people who use custom-loaded ammo. TSA: The packaging for ammunition must be either original packaging or containers designed specifically for ammunition. Plastic ammunition boxes popular with reloaders are acceptable, as well as paper or fiber boxes. Ammunition may be loaded in clips or magazines as long as they are properly secured in a pouch or enclosure designed to secure clips or magazines. NRA: Why does TSA confiscate items that obviously aren’t real firearms or ammunition, such as “silver bullet” key chains or even lapel pins and tie tacks in the shape of miniature firearms? TSA: Replicas are prohibited through the checkpoint, but upon discovery in screening, we encourage the passenger to do one of three things: return to their airline and check the item in their checked baggage, return the item to their car, or mail it back to themselves (if the airport has a mail-back program). If none of those is feasible, the least preferred option is to voluntarily surrender it to TSA. The only exception is if a law has been broken, then the item is turned over to local law enforcement. The problem with “silver bullet” key fob-type items is the burden they place on our system. Our number one priority is security. Realistic replica items are prohibited because they could be mistaken by unknowing passengers or crew members as a real item and lead to an unnecessary situation in the secure area of an airport or in the cabin of an aircraft. Also there is the risk that terrorists could carry what seems to be a replica but is actually part of a dangerous weapon. Obvious non-threat items such as tie tacks in the shape of firearms are now permitted. However, TSA has found small, very real, handguns attached to belt buckles and even one stuffed inside a child’s teddy bear. Every item must be scrutinized very carefully and that detracts from overall security by reducing our efficiency. If there is any question as to whether the replica will be confiscated then we encourage you to pack it in checked baggage. NRA: Are TSA employees trained in the legalities of transporting firearms and ammunition? TSA: Yes, part of the 120 hours of classroom and on the job training our TSA personnel receive includes regulations regarding the identification of and processing of firearms in checked bags. NRA: Are TSA employees trained in the proper ways to handle and inspect checked firearms? TSA: No. In fact, they are specifically prohibited from handling firearms. Should there be an occasion requiring the handling of a firearm, a law enforcement officer is called to handle the firearm. NRA: Do airlines consult TSA regarding the airlines’ rules on transporting firearms and ammunition? TSA: No. Each individual airline determines if, when, and how firearms and ammunition or any other item is allowed aboard their aircraft for transport. Federal law and regulations simply provide guidelines and specific requirements if the airlines choose to allow firearms and ammunition to be transported. NRA: Has there been discussion between TSA and the airline industry in regard to standardizing gun/ammunition transport rules and regulations? TSA: TSA is in discussions with airline industry trade associations to address a number of these issues. The dialogue is geared to developing uniform standards to include the number of firearms permitted in checked bags, the amount of ammunition (in pounds), firearms declaration procedures, declaration tag format, etc. NRA: Does TSA have any involvement in educating ticketing agents about regulations and/or procedures governing transport of firearms and ammunition? TSA: Yes. However, it is usually on a case-by-case basis. Typically, a complaint is received from an individual that will cause us to review procedures with the airlines. We then determine if it is an airline or TSA issue. We then make a determination if the issue is a local or national issue and take corrective action as required. NRA: Do air travelers specifically and separately need to declare both firearms and ammunition? In addition to inspection of firearms, does TSA make any effort to inspect ammunition in checked baggage? TSA: Only firearms are required to be declared. If TSA has a security concern with a checked bag and we discover improperly packed ammunition we will remove the loose or improperly packed ammunition and turn it over to the airline for disposal. NRA: When a disagreement arises between a traveler and TSA personnel, what is the correct protocol for on-site resolution? In such cases would it be helpful for traveling sportsmen to carry a printed copy of TSA firearms/ammunition regulations? TSA: It is very helpful to have firearms and ammunition information from http://www.tsa.gov, as well as the airline’s policy. Should a problem occur, calmly explain the situation to the TSA officer (with policy in hand). If this fails, remain calm and ask to speak with a TSA supervisor. We always try to balance security and customer service, but we realize our officers may not always respond correctly. Any time passengers feel they have been treated improperly or their baggage was mishandled by our personnel we want to know about it. Passengers may call our customer service number at 1-866-289- 9673 or E-mail our contact center at TSA-ContactCenter@dhs.gov. TSA is always looking to improve both security and customer service. NRA: How are TSA firearms/ammunition regulations formulated? What provision is there in the law to change such regulations? TSA: With the creation of TSA in November 2001, responsibility for many of the regulations for transportation of firearms and ammunition were transferred from the FAA to TSA. There have been no actual regulation changes, however, TSA has sought to clarify ambiguities and apply the commonsense test to some of the rules. Our clarification of the original packaging requirement for ammunition is just one example. NRA: How are TSA employees instructed to deal with travelers who accidentally enter security screening detectors carrying firearms or ammunition on their persons or in carry-on luggage? What are the penalties for doing so? TSA: There’s a wide range of procedures TSA has to follow, depending on the circumstances. The most serious occurs when someone brings a loaded handgun to one of our passenger security checkpoints. Once the passenger steps through the metal detector, or places their carry-on baggage on the x-ray belt at our checkpoint, they have presented themselves for screening and TSA has to complete the screening process. If a firearm is detected either on the passenger or in his carry-on items, TSA will engage local law enforcement officers. Aside from possible criminal charges brought forth by law enforcement, TSA has the ability to impose civil case proceedings with fines ranging up to $10,000. While virtually all of the firearms discovered at our checkpoints are believed to be simple mistakes, it is impossible for us to make that determination. TSA personnel must be alert to the possibility of someone testing our system or a passenger unknowingly being used by others to introduce a firearm or other device into our secure areas. Loose rounds of ammunition also can pose an issue at the checkpoint and delay the passenger. An individual with ammunition at the checkpoint may simply receive a warning letter or the incident may result in fines. Improperly packed firearms and ammunition in luggage may also pose an issue. When such an incident occurs, the passenger is called back to the checked baggage screening point and asked to secure the improperly packed item. We recommend allowing extra time for the firearm to be screened so that the passenger can be made aware of any potential issues should they arise. Improperly packaged ammunition often ends up being surrendered. NRA: Is there a toll-free number or website air travelers can call or access to report suspected security violations? What about a toll-free number or website where air travelers can file complaints or offer suggestions about TSA procedures and personnel? TSA: If you would like to pass on any positive feedback or concerns to TSA regarding your experience you should contact a screener supervisor at the airport. You may also contact the TSA Contact Center toll-free at 1-866-289-9673 or you may also E-mail us at TSA-ContactCenter@dhs.gov. The Transportation Security Administration (TSA) takes all input very seriously and will respond promptly and appropriately to all complaints or comments. Please visit our website at www.TSA.gov.